NEW YORK – With striking displays of candor, the Episcopal Church is acknowledging the potency of the #MeToo movement by officially lamenting its past role in sexual exploitation and pledging steps to combat it. The Protestant denomination’s national convention this summer included an emotional session at which first-person accounts of abuse by clergy and other church personnel were read aloud by bishops of the same gender as the victims – six men, six women. Dioceses nationwide are now seeking to gather and share similar stories from victims in their local church communities. That process of story sharing has been particularly dramatic in the Diocese of New York, where Bishop Andrew Dietsche released a blunt pastoral letter Sept. 11. It described the most famous of his predecessors, the late Paul Moore Jr., as a “serial predator” who engaged in “longtime patterns” of sexual exploitation and abuse. 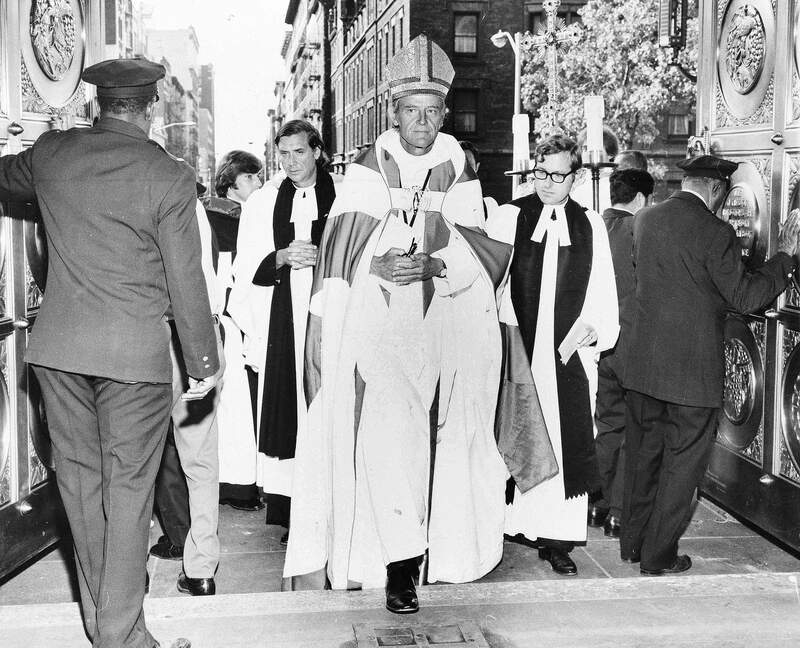 Moore, as charismatic bishop of the diocese from 1972 to 1989, became one of the nation’s foremost liberal Christian activists. He supported the ordination of women and gays while assailing racism, corporate avarice and various U.S. military policies. It has been known for a decade that Moore, who died in 2003, was bisexual and had a long extramarital affair that began when a young man came to him for counseling. Moore’s daughter, Honor Moore, revealed that in a 2008 memoir. Shortly after the memoir’s publication, then-Bishop Mark Sisk issued a pastoral letter describing Moore as “an exploiter of the vulnerable” who had been the subject of multiple complaints. But the scope of Moore’s abusive sexual misconduct has become known only this year, notably at a Catskill Mountains retreat in the spring attended by clergy from the New York diocese. At one session, participants were invited to share stories about difficulties they faced in their ministries. Among those at the event was the Rev. Alison Quin, rector of Christ the King Episcopal Church in Stone Ridge, New York. Neither the retreat session nor Dietsche’s letter have been previously reported. As detailed in the letter, the New York diocese is now seeking to gather first-person stories from abuse victims throughout the community, with plans for a Nov. 9 service that would resemble the national convention session in Austin, Texas, in July. A #MeToo task force formed by the diocese has set up a Google Docs program through which victims can anonymously submit accounts of their experiences. There’s also a help line through which callers can receive confidential pastoral care, and another phone number for victims who want to make an official report of sexual misconduct. The diocese is reaching out to abusers, as well as victims, inviting them to anonymously acknowledge misconduct and repent for it. Mary Glasspool, who serves under Dietsche as an assistant bishop, has been fielding some of the calls to the help line and also tracking responses to the invitation to share stories of sexual abuse and exploitation. “Not everyone wants their story wants their story publicly told – some want it responded to privately,” she said. Ahead of the national convention in Austin, a #MeToo Planning Team organized the “Liturgy of Listening” that featured the first-person accounts of victims. Among those sharing their stories were a church employee subjected to lewd comments from a male rector, a woman raped by a priest from whom she was receiving spiritual guidance and a choir boy subjected to emotional, physical and sexual abuse. Hundreds of people attended the 90-minute service. The Episcopal News Service said some were in tears when it ended; others exchanged hugs with those near them. In some respects, the Episcopalians’ initiatives mirror efforts undertaken this year by the Southern Baptist Convention, the largest Protestant denomination in the U.S., to combat sexual exploitation by clergy and other church personnel. In July, after a series of revelations about misconduct, the SBC announced plans to create a high-level study group to develop strategies for deterring sexual abusers and ministering to their victims. Alison Quin says she and members of her congregation believe the Episcopal church will be stronger for addressing sexual exploitation head-on. “Unhealthy secrets can destroy an institution,” she said.